Truly disruptive innovation doesn’t come around that often with most companies just being an improvement or slightly different enhancement on a current offering. Like the radio, microwave, television, computers and internet before it Airbnb created an entire market that previously just did not really exist. Sure, there were people who rented from other people and there were vacation rentals but such a market was incredibly small and wasn’t designed for use by regular folks. Airbnb started back in 2007 between two friends who just couldn’t pay their rent but noticed a popular design conference coming to San Francisco and yet no rooms available at any hotels. They decided to create a website to allow them to rent out their place and started making $80 a night, helping them cover rent and sparking their desire to develop the idea further. For the first year the startup almost floundered, with a pretty dismal performance at South by Southwest in Austin but after making some money selling an Obama related product and getting some investment, they were able to put more focus on the company. One of the keys to expanding turned out to be getting nicer photos of the places listed on the site, which at the time were not very attractive. They decided to go door to door and get photos that made people want to use the service, this led to the beginning of growth. Within a year things would take off; they raised 7.2 million in late 2010 and an impressive 112 million in July 2011. The service was in the process of quickly crossing the chasm and into the mainstream. Airbnb was certainly not without its challenges in becoming a disruptive innovator. Even after a year they were making only a paltry amount of money that most venture capitalists would laugh at. They also were turned down for investment by some of those now regretful established venture capitalists. Even after entering the tornado of growth they faced a new potentially devastating challenge when in 2011 an apartment rented out on the site was literally trashed and robbed and the company responded with little help. Eventually due to public outcry and continued negative press Airbnb decided that in order to grow it had to build trust and provide security so they issued a public mea culpa and a guarantee of up to $50,000 to any hosts who encountered a similar problem in the future. Since then they have embraced this protection even more and increased it to $1,000,000 and taken a stronger role in responding to problems and mediating disputes. After years of growth Airbnb is now privately valued at 25.5 billion and pulled in nearly a billion dollars last year, with significant growth continuing. Airbnb was quick to cross the chasm that separates those people who just like to try new tech things to those people who are more practical and need something proven first. With any new market disruption there is likely to be some people who have taken a hit as a result. 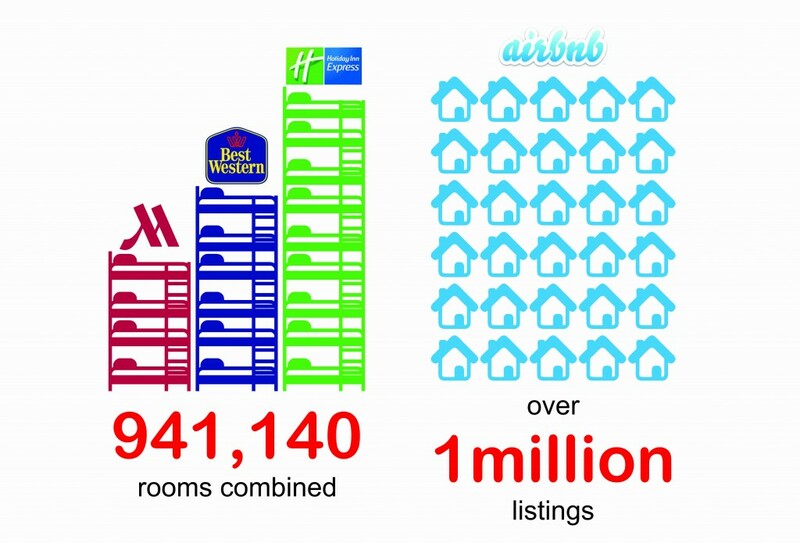 The growth of Airbnb has been a key concern of the hotel industry, where in many cases the size of available rooms by the biggest brands does not even equal the amount available on the service. Since Airbnb involves people renting out their property the potential growth is nearly limitless to demand. Still this is not likely a mortal threat to the hotel industry since Airbnb is not making hotels irrelevant like the car would for the use of riding a horse to work, it’s just flooding the market with more availability and in some cases creating downward price pressure. And with the increased pressure some hotel chains are being pushed to innovate more in their marketing and pricing in order to continue to realize growth. The Wyndham family recently announced 612 million in profit for 2015, showing that while none of them will realize the growth levels of Airbnb, they continue to remain in a healthy state. 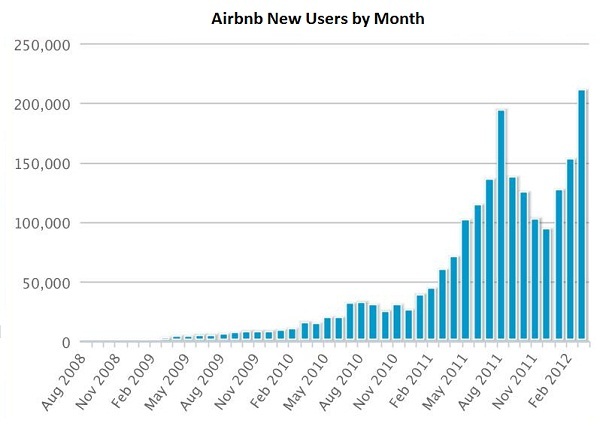 Airbnb launched during a time that saw the rise of another titan of the collaborative economy, Uber. The rise of the car sharing app Uber saw its potential skyrocket in 2010 as investors flocked to both startups as something truly revolutionary. By early 2011 both had nearly $10,000,000 invested and were expanding at the speed of a tornado through a trailer park. Part of the appeal of Airbnb wasn’t just finding a room when none was available, or finding something cheaper but also getting the experience to stay somewhere truly unique. Many tourists want to immerse themselves in local culture and would prefer to stay in a Spanish adobe house brightly adorned rather than a hotel room that looks standard. This is the experience that Airbnb CEO Brian Chesky is trying to imprint on the organization. And many of the most popular Airbnb homes fit the bill with a truly unique experience. 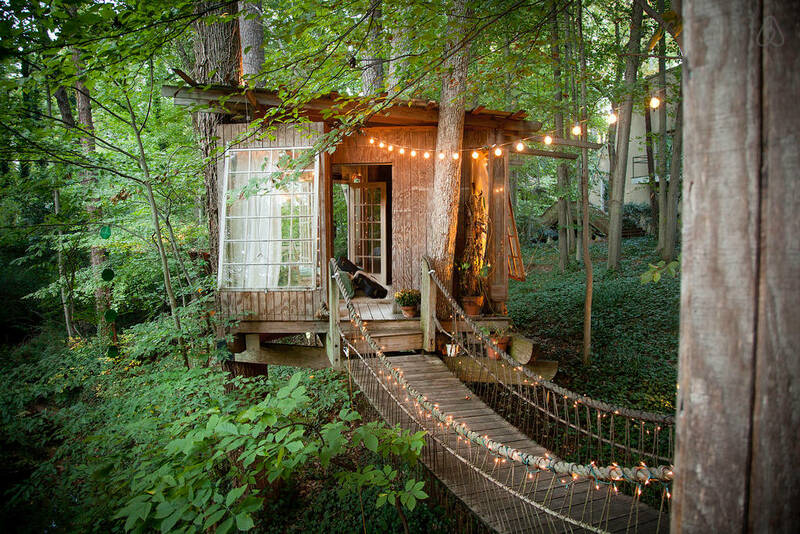 This treehouse located in Georgia sports three separate rooms connected by bridges and is a major favorite and constantly booked. 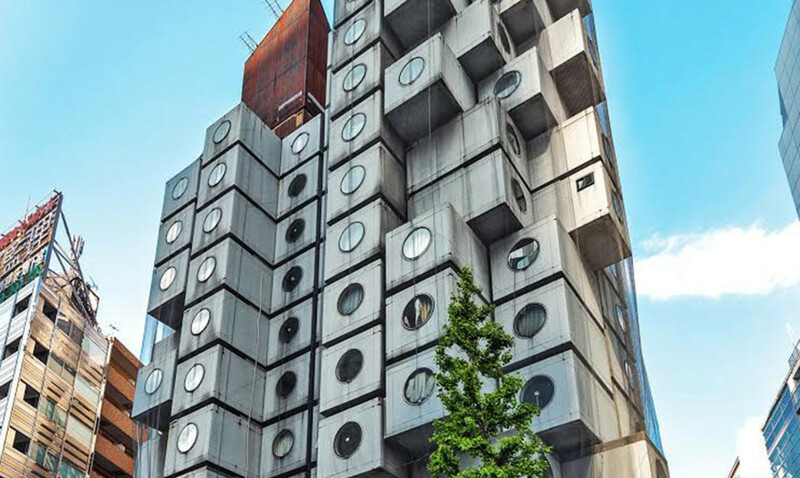 Through Airbnb you can rent a futuristic looking cube in the Nakagin Capsule Tower in Japan. Saves people money. 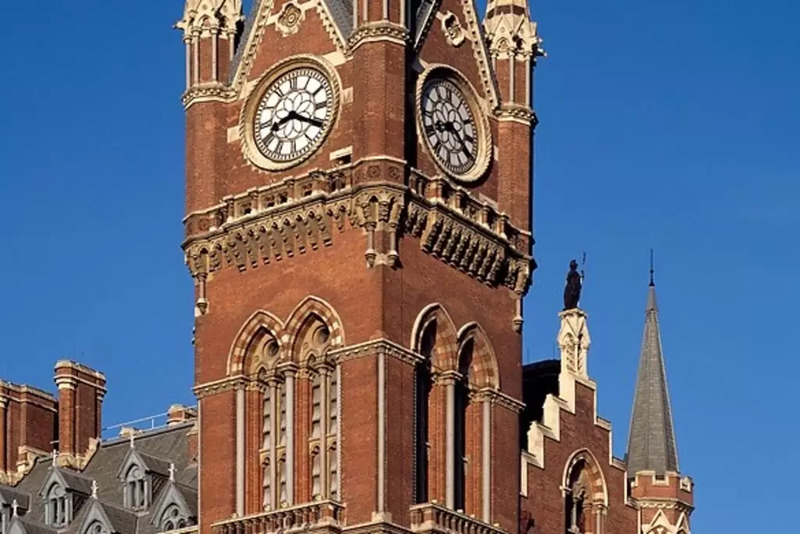 Airbnb in many cases can help people save money even for renting of a full apartment, this is especially true when demand for hotels is high or in the center of metropolitan areas. Of course it also greatly entices people to offer their property for lodging since it makes them money in a relatively simple process. Saves people time. The Airbnb process is relatively simple and straightforward, though it has not innovated to be simpler than what the hotel industry currently offers it has moved more hosts towards instant booking which makes the process just as easy. Can accomplish something that was previously not possible. This was a clear requirement Airbnb met in that it allows you to rent out your house to anyone at the drop of a hat. Brings their life more pleasure. The unique decoration and individual homes have allowed people to have a more immersed culture experience. It’s this defining attribute which more hotel chains will need to compete with using experiential innovation. Have you tried an Airbnb? If so, how would you compare the entire experience to staying at a major chain hotel?